Two op-eds by Brunswick residents published this month in local newspapers expressed that the College should make a greater financial contribution to the town. In a letter to the editor published on November 14 in the Coastal Journal, Brunswick resident Jean Powers called for the town to request a greater gift-in-kind from the College. A majority of Bowdoin’s property—worth approximately $165 million—is tax-exempt, due to the College’s nonprofit status. Like many institutions of higher education, the College gives the town a voluntary annual contribution in lieu of taxes, known as a gift-in-kind. This year, this contribution will be $172,200, an increase from last year’s $167,200. “Looking back long term, you know, from a taxpayer’s standpoint, and just in general the town has been on the short end of that stick,” said Crimmins in a phone interview with the Orient. Despite the college’s tax-exempt status, the College will pay approximately $206,000 to the town in property taxes this year. Some college-owned properties are not eligible for tax-exempt status, including housing for faculty and staff. The College owns $11.2 million worth of taxable property including over 20 rentals across Brunswick for faculty and staff. Other taxable properties include Reed House and Brunswick Apartments. In FY 2016-2017 the College paid over $21,000 in taxes on Reed. While the other seven College Houses are tax-exempt, Reed has remained on the town’s tax rolls. Senior Vice President for Finance and Administration and Treasurer of the College Matt Orlando speculates this has to do with the location of the house on residential Boody Street and the college’s desire not to take revenue away from the town. “Had Reed not existed in that spot, there would be two or three residences on that lot, you could fit two or three houses there, and they would have paid taxes there. So that may have been part of the rationale,” Orlando said. Due to a tenant unconnected to the College residing in one of the units, Brunswick Apartments is also not tax-exempt. Bowdoin contributed $94,000 in property taxes on the complex in the last fiscal year. The College’s annual contribution to the town is decided through the annual budget process, and reviewed by senior staff and President Clayton Rose. Orlando oversees these contributions. 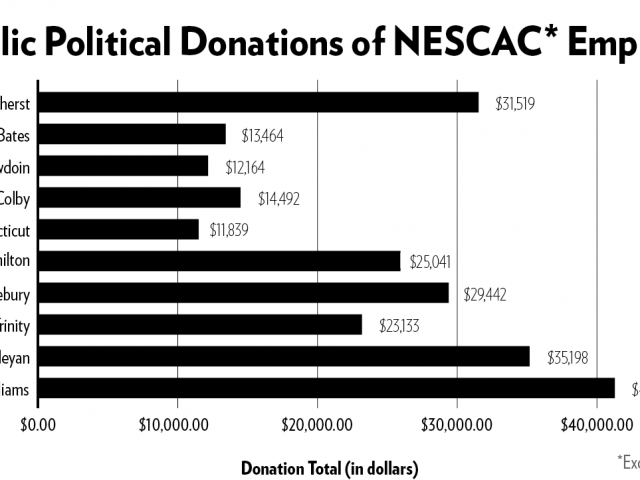 Bowdoin has continued to increase the size of its charitable contribution, according to Orlando, despite an increase in the College’s property taxes—from $187,699 in FY 2016-2017 to $206,497 this current fiscal year— which was due to a town-wide revaluation that was finalized this past summer. 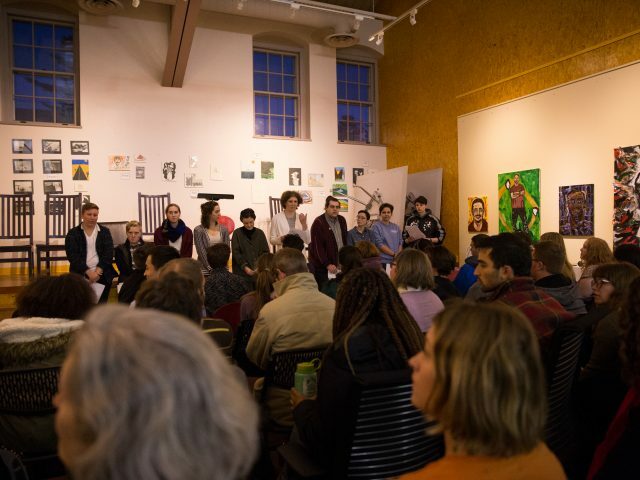 In addition to the annual gift-in-kind, the College regularly contributes to the Brunswick Downtown Association and to the town of Harpswell, where Bowdoin’s tax-exempt Coastal Studies Center is located. It also pays for services provided by the town like policing, fire protection and waste disposal. Orlando pushed back against several of the claims made in Powers’ piece. “We really appreciate the collaboration we have with the town, and we are mutually interested in the vitality and the well-being of the Brunswick community, and the op-ed piece was disappointing in that it omitted all that,” Orlando added. Frank Strasburger, a Brunswick resident and father-in-law of three Bowdoin alumni, wrote a response to Crimmins’ op-ed, defending the various ways that the College contributes to the town and echoing Orlando’s sentiments. “I’m a townie, all too aware of the effect of Bowdoin’s tax-exempt status on my own hefty real estate taxes. But Bowdoin is the very reason we moved here,” he wrote. Strasburger cited opportunities to visit the College’s museums, attend events and audit classes—largely free of charge for residents—as advantages of living in Brunswick. He also mentioned that Bowdoin employs many town residents and allows Brunswick High School’s swim and hockey teams to use its facilities. According to Brunswick Town Council Chair Allison Harris, the debate is not unique to Brunswick or to Bowdoin. “[Bowdoin is] not the only nonprofit that has tax-exempt status in certain areas so that I think that we look at all the tax-exempt institutions and say, gosh, are they paying their fair share?” added Harris. Emily Cohen contributed to this report. Bowdoin announced yesterday that it is initiating a Guest Semester Program for spring 2018 designed to accommodate students who currently attend inoperable universities in Puerto Rico and the U.S. Virgin Islands. Students who cannot attend their schools because of transportation, housing or financial difficulties have until December 18 to apply for the program. This week, Bowdoin hosted the largest event series in the College’s history in recognition of HIV/AIDS. The schedule surrounding today’s World AIDS Day recognition has so far included a screening of the Oscar nominated documentary “How to Survive a Plague,” as well as a discussion with a cast member and a panel on the local and global view of HIV/AIDS.